Hoopman Equipment & Engineering B.V. (E&E) is a specialist in application machines for seeds. The latest development work resulted in two unique coating/drying systems. Since ICI’s development of the rotary coating machine there are many conventional seed coating machines replaced by this still recent pesticide application principle. 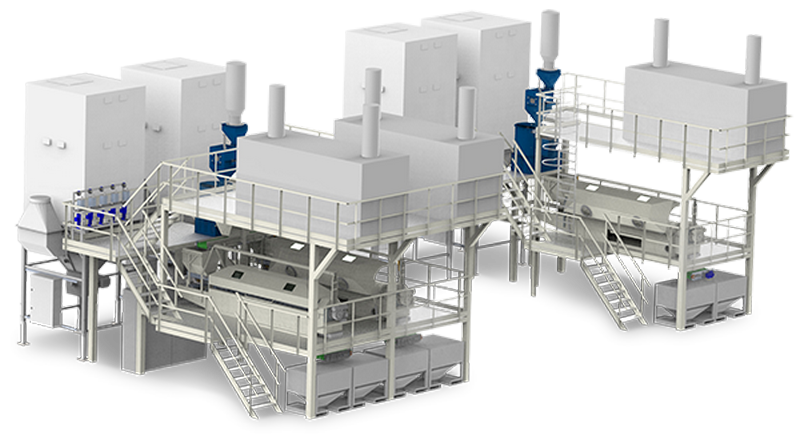 Our new development is, that we have created the opportunity to combine the extremely fast pesticide application possibilities of the rotary coater with a unique non vibrating fluidized bed dryer system. We do not use the rotary coater for drying, because this strongly influences the capacity of the rotary coating system. For higher loading and seed damage risk (due to intense mixing in rotary coaters) we developed an ICD (integrated drying/coating) system. For more information see ICD. So we currently have two seed coating systems available. Both systems are available as complete automatic coating and drying systems. All machines can be equipped with a touch-screen panel to support the operator to execute optimal and easy coating and drying processes. In addition, it is possible to easily save/retrieve recipes. All E&E coaters are designed in such a way, that they can do both Filmcoating, Encrusting and Pelleting processes.